Little, Brown Books for Young Readers, 9780316056212, 336pp. This thrilling bestseller and National Book Award Finalist is a gritty, high-stakes adventure of a teenage boy faced with conflicting loyalties, set in a dark future America devastated by the forces of climate change. In this powerful novel, Hugo and Nebula Award winning author Paolo Bacigalupi delivers a fast-paced adventure set in the vivid and raw, uncertain future of his companion novels The Drowned Cities and Tool of War. Paolo Bacigalupi is a rising star in the science fiction community. The author of Pump Six and Other Stories and The Windup Girl, he is both a Nebula and Hugo Award nominee, and the winner of the Theodore Sturgeon Memorial Award for best science fiction short story and two Locus Awards for best collection and best novelette. Paolo lives in western Colorado with his wife and son. 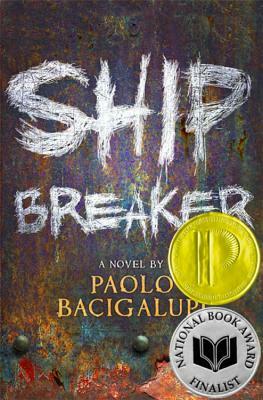 Ship Breaker is his first novel for young adults.